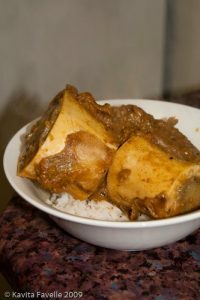 When my sister and I were kids, we’d fight over the marrow bones in mum’s lamb curry. 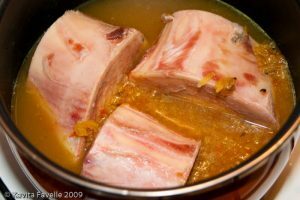 Mum would usually make it with leg or shoulder of lamb, which she’d have the butcher cut into large pieces, with the bones left in. The marrow managed to retain it’s distinct oleaginous texture and taste whilst also taking on some of the rich, fragrant flavours of the spices, tomato, onions, ginger and garlic that make up the curry sauce. You can surely understand why we were so insistent that mum shared out the marrow bone pieces with scrupulous fairness! Every now and then, she’d ask the butcher for extra marrow bones. Back then, people asked for these to feed to their pets, so when she said, no they were for her children, the butcher jumped to conclusions about family finances! Mum had to explain that actually, her girls adored marrow bone and that she was buying it for a treat. But he never would charge her more than a few pence for them! And this one of mum’s girls still adores marrow bone – both lamb and beef – so was delighted when Paganum‘s Chris Wildman kindly put some beef marrow bones into the box for me! 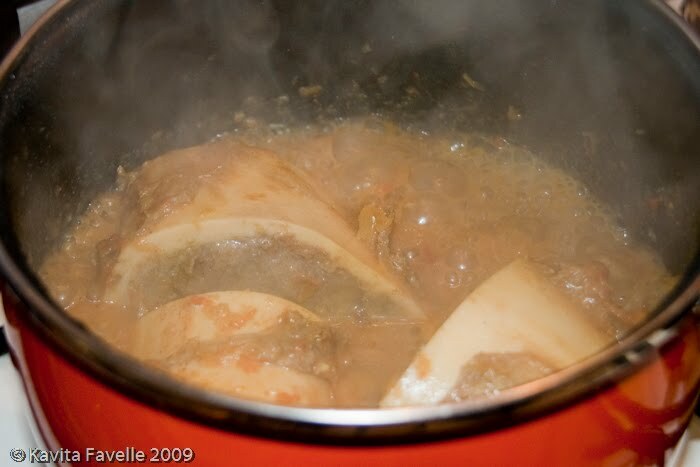 As we were cooking mum’s egg curry recipe anyway, the base of which is not disimilar to that of the lamb curry I decided to make extra sauce and used half of it, with added water to thin and increase the volume, to cook my three huge marrow bones. I left the three huge bones bubbling away until the marrow was cooked and the sauce reduced. Of course, my eyes were far bigger than my belly, and I couldn’t finish all three but I can tell you that I really, really, really enjoyed this very nostalgic treat! 9 Comments to "Curried Beef Marrow Bone: A Trip Down Memory Lane"
One of my favourite things. My partner's mother cooks some form of mutton curry for us almsot weekly and there's always a good amount of marrow to go round – we all love it. 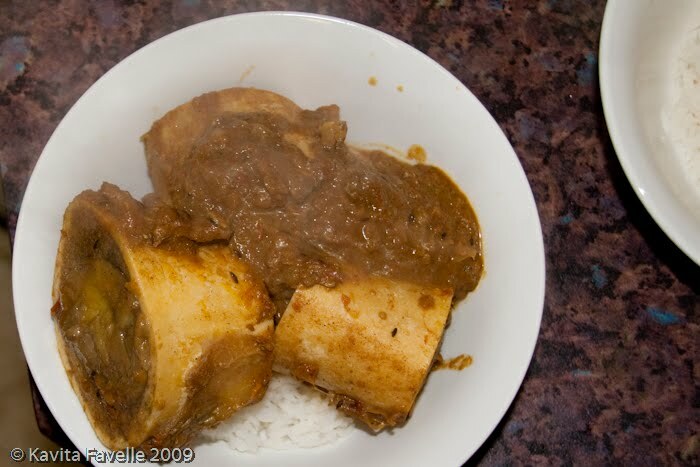 I used to do most of my Caribbean curries off the bone but have taken to using goat cut the Caribbean way (ie,. across the bone) just so we get the marrow. Of course, sometimes it falls out, but that just adds the unxiousness of the gravy. Delicious! 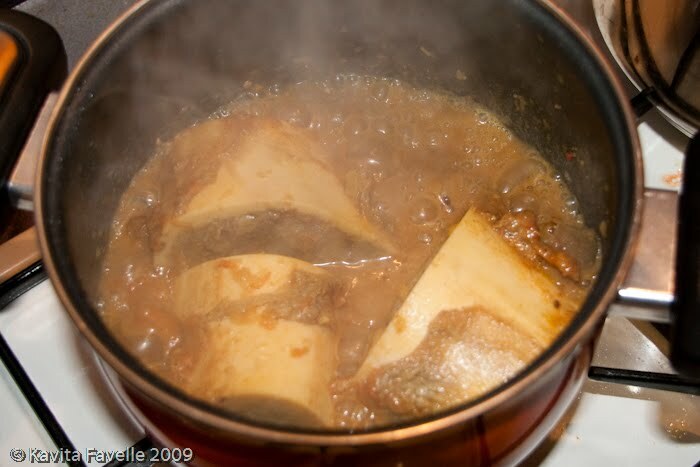 How long do you cook beef marrow bones? Do you use a pressure cooker? This curry looks amazing! Hi Fatima, I’m afraid I didn’t note it down, I let it cook for quite a while until the marrow looked firmer and the cooking liquid had reduced in volume. I didn’t use a pressure cooker, I made it on the stove top in a heavy-based casserole dish. I am sorry I don’t recall more accurately. Thanks for your response and thanks for reminding me of this great treat. 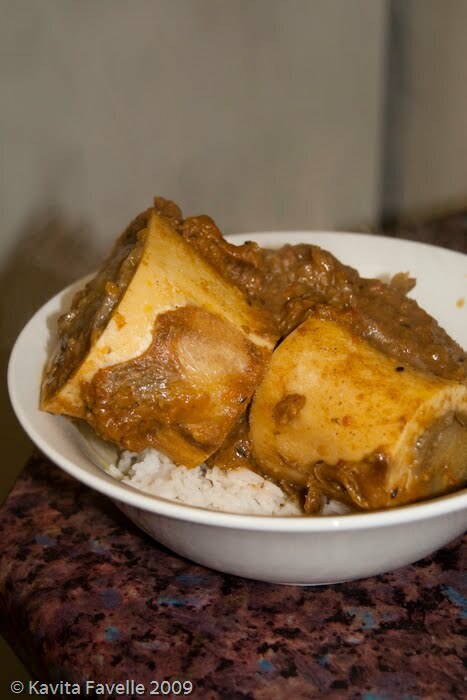 Like you I too battled my younger sister when it came to devouring mom’s marrow bone curry. After seeing this post I was more than ready to give cooking this delicacy a go. Thanks again kavey. 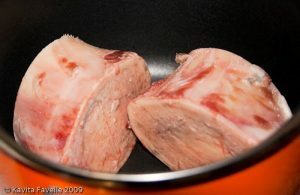 Can I use cow femur instead of lamb? I am sorry I have no idea, I’ve never tried that at all.